A six-hour string quartet – Morton Feldman’s String Quartet No. 2 – will be broadcast live over the web from Brooklyn on Sunday, beginning at 11:30 a.m. EST. The heroic musicians attempting this feat are a group called Ne(x)tworks and the stream will be available at Q2 Music, broadcast from 110 Livingston Street, home of Issue Project Room. The director of the group is violinist Cornelius Dufallo, who played in this piece's premiere in 1999. "The focus at the time seemed to be on how we were going to play for six hours without stopping," said Dufallo. "As we immersed ourselves in the music, however, this began to change: we found that duration is by no means the most interesting aspect of this work. In this work, duration acts as a canvas, on which Feldman paints a stunningly beautiful encomium to the eternal marriage of sound and time. The piece must exist on a large scale in order to portray this relationship." The Omaha Symphony's 10-year concertmaster, Amy Sims, announced last week that she will not return for the 2010-2011 season, according to the Omaha World-Herald. She said she plans to pursue early music performance. The orchestra will hold auditions in the near future and select three finalists, who will each perform in two concerts next season to determine the next concertmaster. 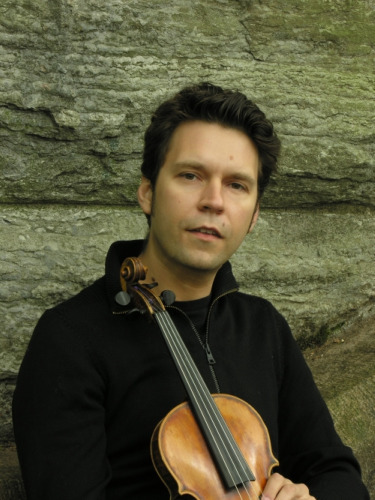 Violinist David Perry, reports that his violin, labelled "Laurentius Storioni fecit Cremonae 17..", in its brown oblong case with 3 bows, was stolen on a train in Belgium on March 27, 2010. Here are descriptions of the bows: first bow – C.N. Bazin, no brand; second bow – branded "L. Panormo"; third bow – an unbranded German bow (ca. 1920, Markneukirchen, gold-mounted, ebony frog). A picture of the violin can be found on this page. If you have any information, please contact David at davidperry_2@hotmail.com. I always enjoy investors talking about the wisdom of buying an old fiddle, so this article from thisismoney.co.uk fascinated me. In it, dealer Florian Leonhard talks about "investors putting in a minimum of £5,000 each for a share of a top musical instrument." The article goes on to explain: "'With violins worth at least £100,000 we calculate that investors have made average returns of 10.8% a year over the past three decades,' (Leonhard) says. 'If the syndicate gets an up-and-coming musician who goes on to become famous, the value of the instrument may rise even further because a violin played by a well-known musician tends to become worth far more.' If a violin has been owned by a famous virtuoso performer such as Yehudi Menuhin or Niccolo Paganini, the value instantly more than doubles. Florian believes although making profits is a vital consideration, most people in the syndicate get a bigger thrill from being able to help out a musician." Keith Cerny, 47, was named new general director of the Dallas Opera. Cerny, who is the CEO of Sheet Music Plus, replaces George Steel, who left in January after only four months as director in Dallas to head the New York City Opera. Cerny will officially begin in May as seventh general director of the 53-year-old company. Check the Dallas Morning News for more. Where does the future lie for the classical recording industry? "The two main trends for orchestras these days are to sell their own CDs and to deliver their performances to personal computers, where the developments are livelier. The New York Philharmonic and the Berlin Philharmonic offer two of the most ambitious programs, although their approaches differ," said Daniel J. Wakin last week in a New York Times story. They have my full sympathy. We are all human, and when you are constantly carrying your violin around, it is quite possible to leave it places. In fact, a large percentage of people have done so, according to a poll we took not too long ago. Sam, you actually don't know the story, you just seem to be spewing hatred. It's sad. But yes, if someone's violin is stolen, I am happy to help them get the word out so they can find it. "you just seem to be spewing hatred"
Laurie, so you choose to make this something that it is not?...Nobody is Spewing Hatred. unless it is you and directed at me...Saying I have no pity for someone who "leaves an instrument unguarded" just happens to be "MY" opinion, but hardly shows hatred; and is not intended to show such. Well I, for one, sympathize with the poor guy for losing his fiddle. Me, too! He's going to post a blog with pictures of it soon, so maybe that will help as well. This is something that any member can do, use your blog to disseminate information about a stolen or lost violin. Well, for sure humankind can be easilly tired, distractable and sociable which can lead to forget one's wodden friend. But, I do think that when one has a valuable instrument (as soloists with old italians...) or even just an amateur that loves his violin and consider it to be unreplaceble for many reasons, one has a certain responsibility. Just as with kids or pets. This is like when we hear about these strad/Taxi stories... Sure someone can gaz you, beat you or so and take the violin??? But I don't think it's always that extreme situations. Perhaps more innatention, late evening party etc? But I don't know anything of this present situation so I won't judge. I am speaking generally. Sure it's always very sad and it's wonderful that v.com can help these people to spread the word! And also a powerful reminder for anyone who loves his/her violon of how easy it is to get it steal... and how important it is to protect it. I lost an Italian violin, a Vignali and a Greunke bow in a car break-in that I was too naive to see coming. That was in 1975 and I still have nightmares about it. I really can sympathize!!! Amy Sims was a fine concertmistress in Omaha, and we will miss her.